While writing this, it is the last day of November and officially 18 hours more before December kicks in. It is supposedly "the most wonderful time of the year" but considering traffic, shopping crowds and all the hassles paired with Christmas rush, it can also be the most stressful days. You seriously have to be organized. 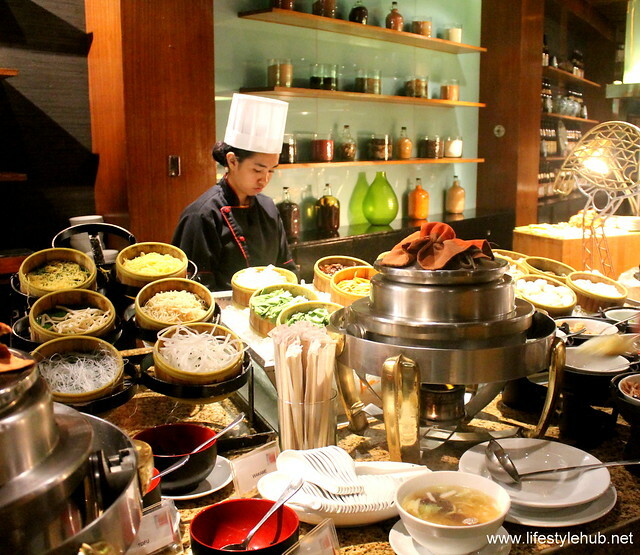 A few weeks ago, I had a dinner buffet with friends in Seven Corners in Crowne Plaza Galleria in between busy blogging events. I had two events in nearby Shangri-La Plaza and at the Greenhills area before that and then a play to watch at the Meralco Theater after dinner. Thank goodness (REASON #1), Seven Corners is very accessible. 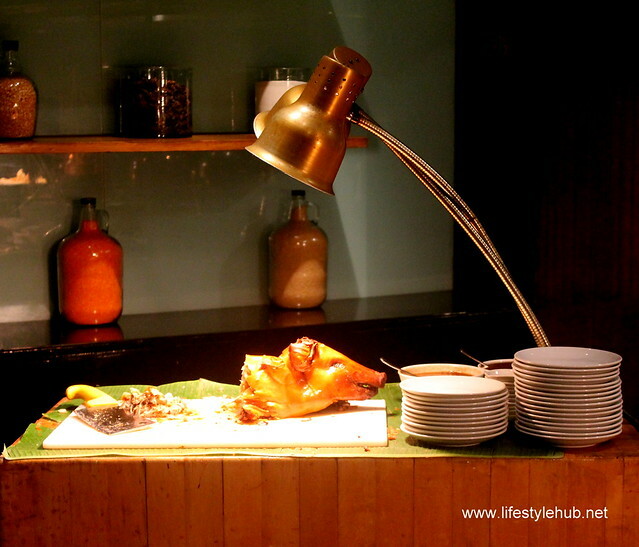 You don't have to travel long to the ends of Manila just to treat yourself and your friends. REASON #2 - Another surprise is, despite being stuck in the middle of the busy Ortigas area and even if I was time conscious, I actually had a relaxing time dining. 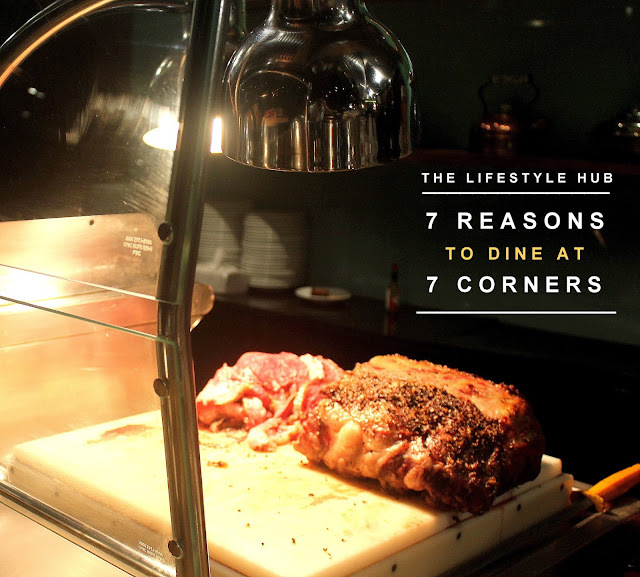 Seven Corners lifts you away from the feels of being in the middle of a business district with the perfect dining ambiance. 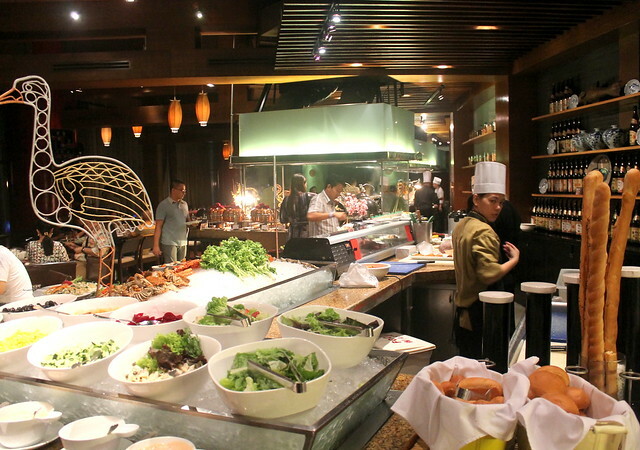 REASON #3 - As the name suggests, the restaurant boasts 7 live buffet stations; appetizers, grilling, Japanese, Asian Noodles with Pasta and Pizza, the Mains station, carving, and the desserts station. To be honest, I regret eating heavy lunch before going there. I could've devoured all the mouthwatering food from each station but I look forward to next time. Let this be a warning. Starve yourself before going there. REASON #4 - There is an entire station dedicated to the US Rib Eye! I wasn't really hungry but there's no way I am missing the steak. Two plates of perfectly well-done meat and I forgot that we were actually in a hurry to catch a play. REASON #5 - Recently, seafood are a revelation. I hated seafood growing up but blogging changed my perspective about dishes made out of our friends from under water. 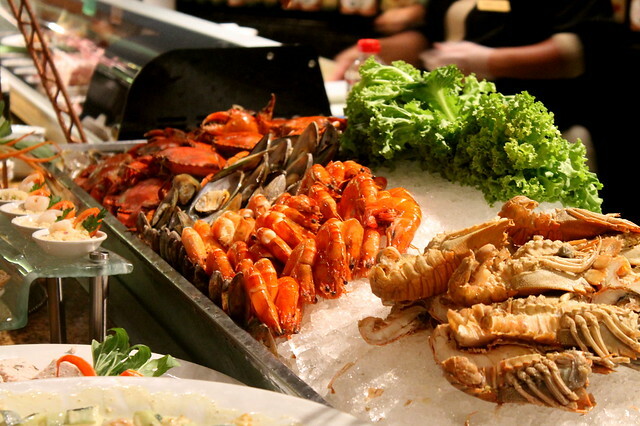 The grilling station in Seven Corners features and abundant supply of seafood which can be cooked however you like it. 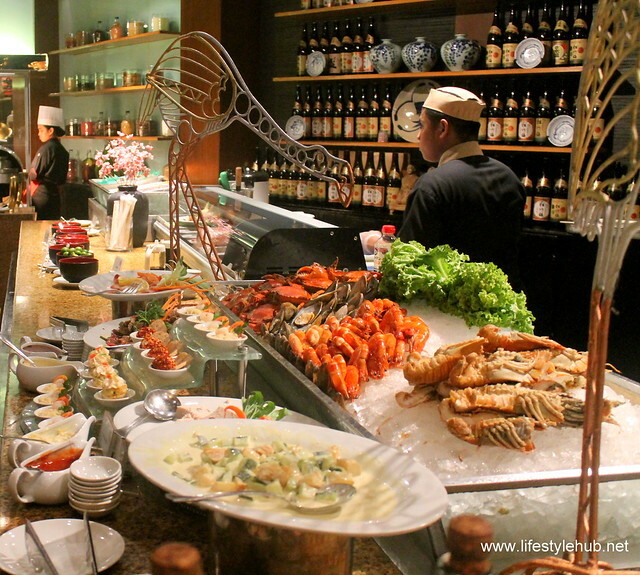 Lobsters, clams, mussels and prawns can taste really fresh and good even if you are in a business district. 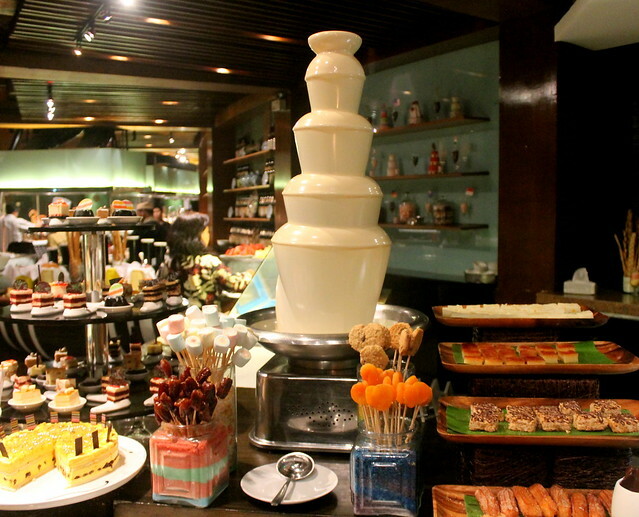 REASON #6 - Desserts, desserts, cheese, fruits and then get more desserts! Who doesn't wanna end a great meal with sweet delights? I'm not sure about you but the reason why desserts are always served last is because it is supposed to be the highlight of a meal. 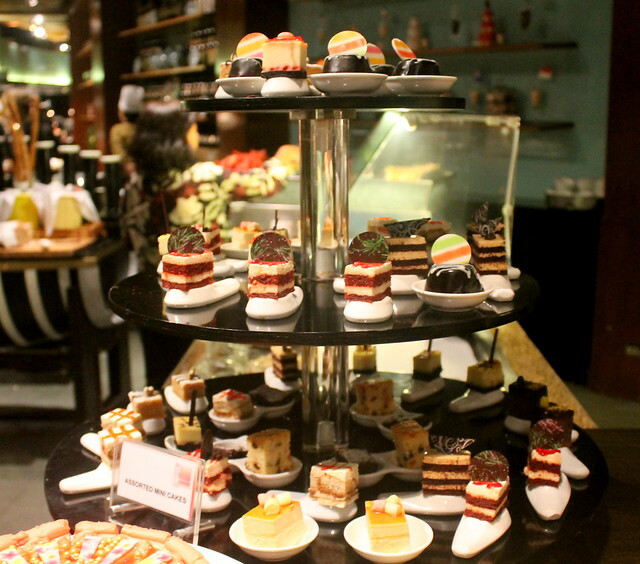 In Seven Corners, a huge assortment of cakes, from chocolate to red velvet, can be perfectly paired with your coffee or tea. 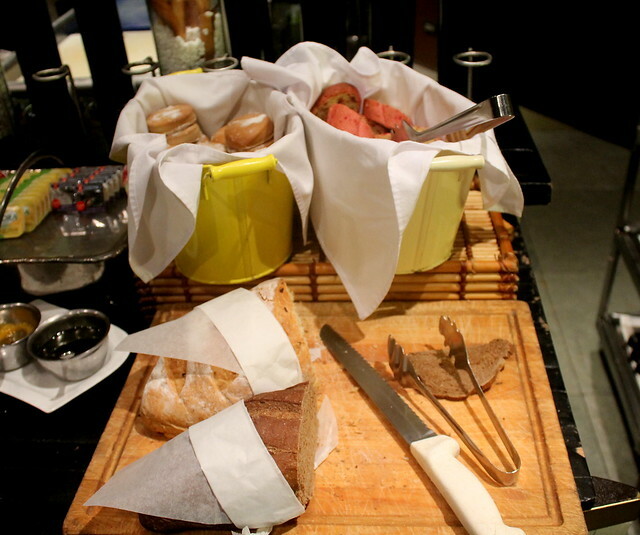 Going back to step one, the Appetizer station also serves a good selection of breads and international cheeses: brie, emmental, gruyere and edam. You can also start light with salads. You can make your own or pick from the pre-made bowls. You can also add fruits to your greens, your choice! 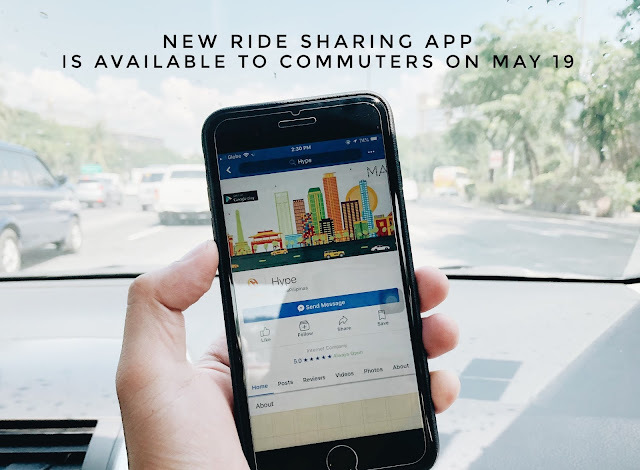 Seven Corners is at the third floor of Crowne Plaza Manila Galleria, Ortigas Avenue corner ADB Avenue. You can call 02 633 7222 for reservations.